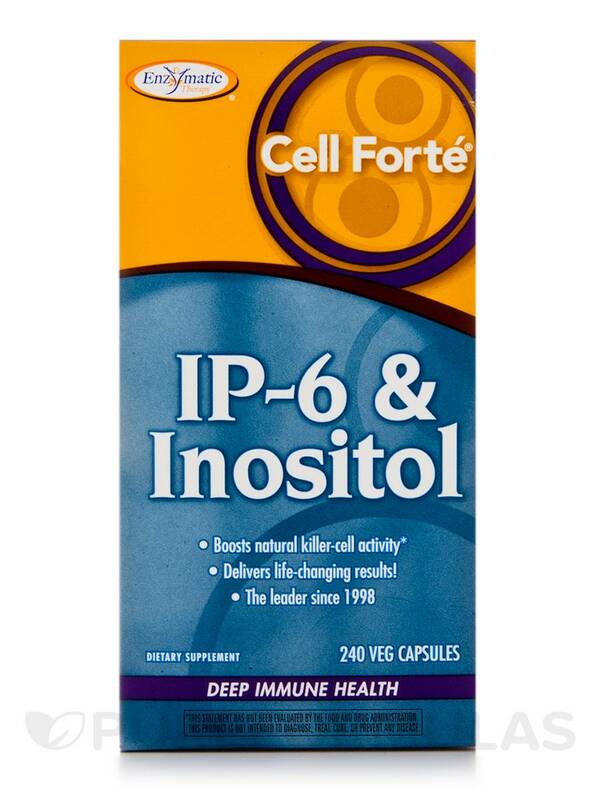 Cell Forte IP-6 & Inositol by Enzymatic Therapy is a formula made to possibly help support a healthy immune system. Calcium (from Calcium Magnesium Phytate): Acts as an antioxidant and it’s believed that it might help diminish harm to cells. Phosphorus (from Calcium Magnesium Phytate): May possibly help in energy cell production. Magnesium (from Calcium Magnesium Phytate): Might be able to promote cellular repair and regulate the hormonal activities in the body. IP6 (Inositol Hexaphosphate) (from Calcium Magnesium Phytate): Acts as an antioxidant and is believed to help to combat free radicals that damage the cells. Inositol: Might be able to help create the myelin sheath around the nerves and metabolize fat for the protection of the heart and kidneys. Before taking Cell Forte IP-6 & Inositol as a dietary supplement‚ please consult with your physician to see if this product is right for you. Other Ingredients: Cellulose‚ plant-derived capsule (modified cellulose)‚ magnesium stearate. No gluten‚ sugar‚ salt‚ yeast‚ wheat‚ soy‚ dairy products‚ artificial colors‚ flavors or preservatives. Take 2 capsules twice daily. Best taken on an empty stomach. Up to 10 capsules per day may be taken as needed. Awesome question, Helen. Stated in the description tab of the product page; Cell Forte IP-6 & Inositol by Enzymatic Therapy is a formula made to possibly help support a healthy immune system. When it comes to medical conditions please speak to a trusted doctor for proper assistance.